As every parent and teacher knows, the use of games in education is old hat. Games are part and parcel of a child’s early years at home, used extensively in primary education, less in secondary (where wordsearches become king, as supply and burnt-out teachers will testify), hardly at all in FE, and all but disappear in Higher Education. HE lecturers/administrators, onlookers, and probably many students, would call this progression or growing up. As children mature and turn into adults, their need for games as a stimulant or entry into learning dissipates. 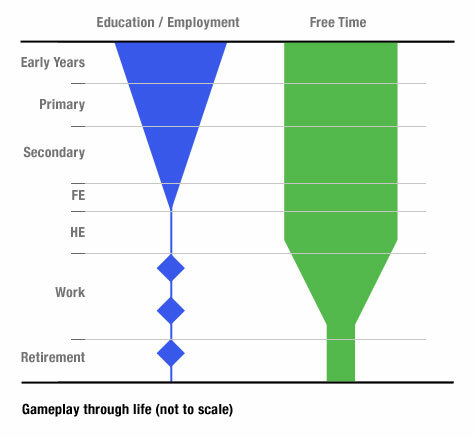 But if this is the case, why do so many students play games in their spare time? In fact, let’s extend that to most 20, 30 and increasingly older aged individuals: the rise in the use of the gameboy, playstation, PC, online and mobile games has spread upward with the 70s/80s generations, and there are many tales of students or workers crawling in of a morning bleary eyed after spending the night chasing orcs or honing that 40-yard virtual drive. It’s not just in their free time that workers are encountering games either: many companies now run bonding, management or other sessions through game-based centres or activities (paintballing, rafting, murder mystery weekends, zorbing and many more I’ve not heard of yet). And when it comes to retirement, the current generation of whist, bingo and poker players keep minds active and occupied through our ever-extending lifespans. With all this in mind (and referring to a little chart I made to illustrate the above), there’s a rather obvious blank space. Uniquely, Higher Education provides the only solid block in life where gaming is absent. Indeed, it is almost universally frowned upon as non-academic. Here’s a little task to leave you with: try searching your favourite abstract store (or Google Scholar) for articles on gaming in higher education. Now try searching the same site for articles covering the problem of motivation, engagement, critical understanding and dropout in higher education.